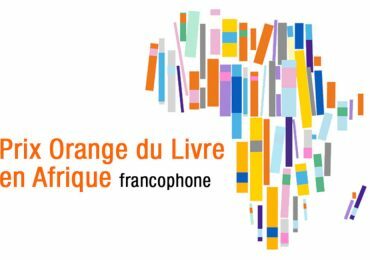 Acclaimed South African novelist Justin Cartwright has died, aged seventy-three. Cartwright passed away on Monday, 3 December, according to The Bookseller. Justin Cartwright and Shaun Johnson at the launch of Cartwright’s To Heaven By Water in 2009. Cartwright was born in Cape Town, and grew up in Johannesburg, where his father, Alan P Cartwright, was the editor of the Rand Daily Mail newspaper. 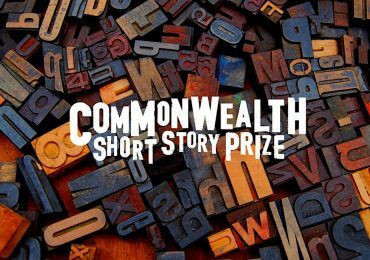 Cartwright’s family lived two streets away from Nadine Gordimer, and he wrote in 2011 that when he was growing up, ‘the penumbra of her fame fell on our small house, lower down the hill’. 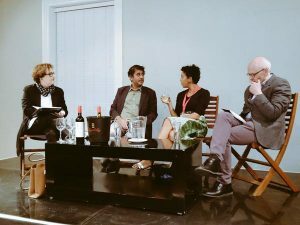 Michele Magwood, Imraan Coovadia, Namwali Serpell and Justin Cartwright at the Open Book Festival in Cape Town in 2015. Cartwright attended high school in Cape Town, and then Wits University, before a move to Oxford University in the late-nineteen-sixties, as a Rhodes scholar. He lived in England from then on, although he visited South Africa often. 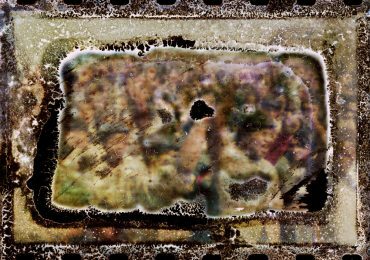 In the nineteen-eighties and early nineteen-nineties Cartwright worked in film and television, including producing political party broadcasts for the Liberal Party and the Liberal-SDP Alliance during the British general elections. For this work he was awarded an MBE (Member of the Most Excellent Order of the British Empire). 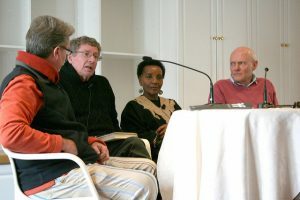 Shaun Johnson, André Brink, Sindiwe Magona and Justin Cartwright at the Franschhoek Literary Festival in 2009. Cartwright was the author of thirteen novels, which tended to blend adventure and satire. His writing was often compared to Graham Greene and Evelyn Waugh, and he himself named his influences as Saul Bellow, John Updike and Alan Paton. 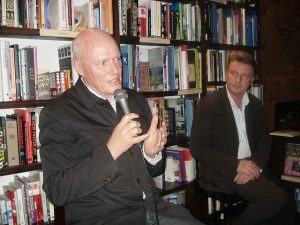 His debut, Deep Six, was published in 1972, but his first attempts at literary fiction were written in the nineteen-eighties, beginning with Freedom for the Wolves (1983) and Interior (1988). He wrote the screen adaptation for his 1990 novel Look at it this Way, which was made into a drama series, broadcast on the BBC and starring Kristin Scott Thomas. 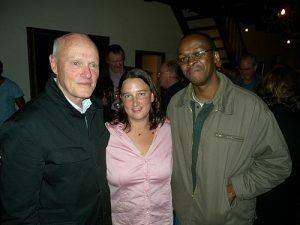 Justin Cartwright, Henrietta Rose-Innes and Phakama Mbonambi at the 2009 Franschhoek Literary Festival. 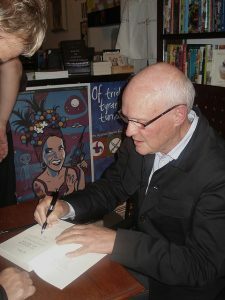 Cartwright signing novels at the Book Lounge in Cape Town in 2009.
published in 1998, won the Whitbread Award in 1998, and his acclaimed 2002 novel White Lightning was shortlisted for the same award. 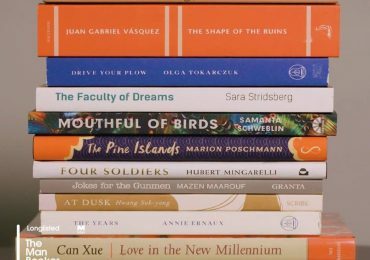 The Promise of Happiness, published in 2005, was the winner of the Hawthornden Prize and the Sunday Times Fiction Prize. 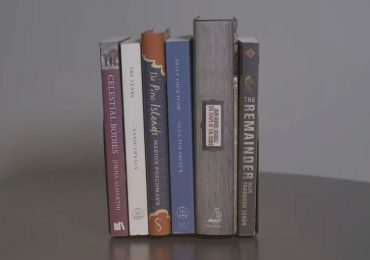 His most recent novel, Up Against the Night, was published in 2015. According to The Bookseller, there will be a service of thanksgiving in tribute to Cartwright next year with more details announced nearer the time. The JRB extends condolences to Cartwright’s wife, Penny, and his sons, Rufus and Serge.